Short stories, good short stories, take me a long time to read. When I read a novel I like, I barrel through it to get to the end, but in a collection of short stories, when they are wonderful, I take my time. I put the book away, physically reshelve it (as opposed to leaving it in the pile of books next to the couch, where all the crime books I review live) and wait until I need it another day. So it goes that reading a book of short stories can take me weeks, months, even years—I still haven’t finished Miranda July’s No One Belongs Here More Than You—because I have a choice about when I finish it. 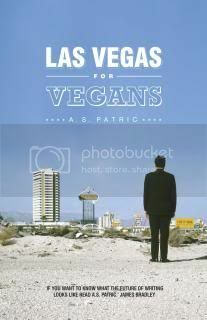 Las Vegas for Vegans was given to me by the author back when it came out, late last year, and I started it straight away. About five months later, I finished it on my couch, the baby finally asleep in her room, an expanse of time in front of me that was exactly right for Las Vegas for Vegans. I went into the study, retrieved it from the shelf (don’t laugh, it is shelved under blue), and read the final third that I had been saving for good, like a literary front room. It is the kind of collection that makes you rethink how words fit together and how stories are told. Some I didn’t like. Some made me sad. (And it isn’t a recommended travel guide for traveling vegans at all.) I have folded down so many corners for turns of phrase or scenes that struck me in some way that to put them in here would probably violate copyright and have me arrested. My only regret—and I know reviewers write this type of thing all the time but I am nothing if not unoriginal—is that I’ve now read them all, that the next time I have this quiet sleeping hour free, I won’t be able to read them fresh. I’ll just have to read them again. Opinions, opinions! Come one, come all.